Artist’s conception of the hypothetical Planet Nine, sometimes referred to as Planet X. The discovery of new dwarf planet in the outer reaches of the Solar System is providing additional evidence of its existence. Astronomers have discovered an object, dubbed “the Goblin,” in the outer reaches of the Solar System. The dwarf planet never gets any closer to the Sun than 6 billion miles, but experts say its orbital configuration points to the existence of a much larger, more distant planet —the elusive Planet Nine. 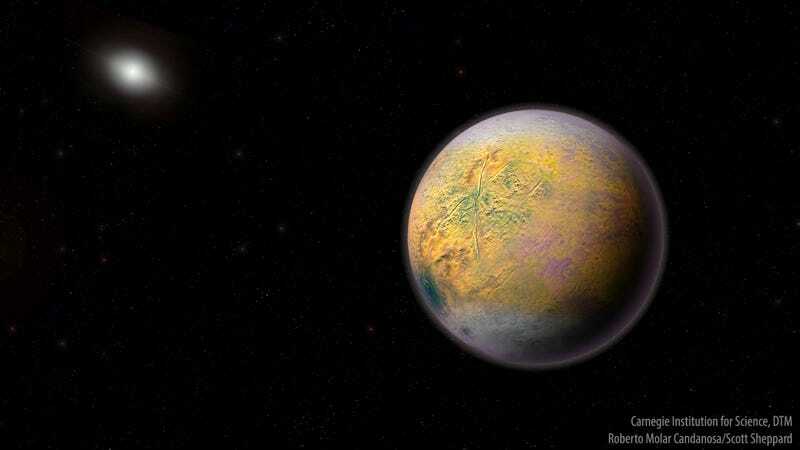 The Goblin, or 2015 TG38 as it’s more formally called, is what’s known as an extreme trans-Neptunian object, or ETNO. As the moniker implies, these objects, of which there are potentially thousands, are located well beyond the orbit of Neptune. What’s remarkable is not that the Goblin exists, but that astronomers were actually able to detect it. The researchers who discovered the object, a team led by Scott Sheppard from the Carnegie Institution for Science and Chadwick Trujillo from Northern Arizona University, estimate that the Goblin is around 185 miles (300 kilometers) in diameter. At this size, it could very well be sphere-like in shape. Its mean distance from the Sun is about 80 astronomical units (AU), where 1 AU is the average distance from the Earth to the Sun. That’s 7.45 billion miles, or 12 billion kilometers. Diagram showing the orbital path of Goblin relative to other Solar System objects. The new dwarf planet joins Sedna and 2012 VP113 as the only three known Inner Oort Cloud objects. For comparison, Pluto is about 34 AU from the Sun, so the Goblin is roughly 2.5 times farther away. So yeah, it’s out there. But it actually gets even farther away than that—the Goblin has a super-elongated orbit. It takes about 40,000 years for this ETNO to complete a full cycle around the Sun, but it never gets any closer than about 65 AU—its perihelion point. Two other known ETNOs, 2012 VP113 (also discovered by Sheppard and Trujillo) and Sedna have even longer perihelia, at 80 AU and 76 AU respectively. Goblin now boasts the third-most distant perihelion known, but its aphelion, the point at which it’s the farthest from the Sun, is a whopping 2,300 AU. That’s 313.8 billion miles, or 503 billion kilometers. Two-frame telescopic images showing Goblin moving across the sky. The Goblin’s extreme orbital path means it never comes close enough to impose gravitational influence on the Solar System’s giant planets, like Neptune or Jupiter. And at the astounding distance of 2,300 AU, it gets slotted into an emerging astronomical category known as Inner Oort Cloud objects (IOCs), of which 2012 VP113 and Sedna are the only other two known members. 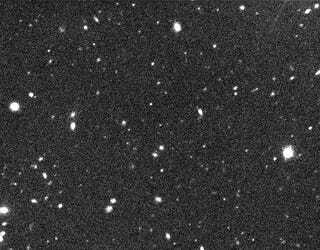 Mike Brown, an astronomer at the California Institute of Technology who wasn’t affiliated with the new study, says it’s important to understand that this isn’t the Oort Cloud, which is much further away, beginning at around 2,000 to 5,000 AU and reaching out as far as 50,000 AU. Solar system perspective, planets (obviously) not to scale. The first glimpse of the Goblin was made in October 2015 at the Japanese Subaru 8-meter telescope located atop Mauna Kea in Hawaii, but it took years of observations to confirm its true identity. The researchers needed to acquire accurate measurements of its orbit—not an easy task, given how slowly it’s moving and its protracted orbital period. Measurements made from 2015 to 2018 by the Magellan telescope at Carnegie’s Las Campanas Observatory in Chile helped to both determine and confirm Goblin’s orbital configuration. The discovery of 2015 TG38 is bolstering the case for Planet Nine—a hypothetical planet, sometimes referred to as Planet X, that’s allegedly several times larger than Earth and located hundreds of AU away. As noted in the new study, published today in The Astronomical Journal, the location of Goblin’s perihelion is similar to what’s observed with Sedna and 2012 VP113, along with other ETNOs. This is a clue to astronomers that something potentially big, i.e. a super-Earth, is pushing these objects into similar types of orbits. With the help of study co-author Nathan Kaib from the University of Oklahoma, the researchers ran various computer simulations. In most cases, the hypothetical Planet Nine prevented Goblin from approaching too closely—an effect referred to as gravitational shepherding. This effect could potentially explain why other ETNOs have similar orbits. “What makes this result really interesting is that Planet Nine seems to affect 2015 TG387 the same way as all the other extremely distant Solar System objects. These simulations do not prove that there’s another massive planet in our Solar System, but they are further evidence that something big could be out there,” said Trujillo. Astronomer Carlos de la Fuente Marcos from Complutense University of Madrid, not affiliated with the new study, said he like the new paper and that the survey was “state-of-the-art” and the conclusions reached “sound and robust.” He also agrees that the discovery adds credence to the existence of Planet Nine. Few alternatives are possible, said Marcos. Either Goblin was thrown into its current orbital path by something that happened during the formation of the Solar System, or it reached its present-day orbit as a result of a more recent interaction with a yet-to-observed planet, that is, Planet Nine. However, Brown says some gravitational effects could include random encounters with nearby stars that are, by their nature, unpredictable in their pattern. Given the extreme distances involved, however, Brown admits this presents a very challenging proposition. The other astronomers we spoke to, however, thought a mission to the Goblin might be a good idea, but they admitted it would be a massive logistical challenge given the extreme distances involved. The New Horizon probe, for example, will visit Kuiper Belt object Ultimate Thule, aka MU69, on New Year’s Day 2019. This object is 40 to 50 times further away than Earth is from the Sun, and the probe has been traveling since 2006. To reach Goblin or a proposed Planet Nine, it would be four to five times that journey, or even further still. Should we ever achieve this immense challenge, however, Daniel Brown said we stand to learn about the chemical and structural composition of IOCs, giving us “even more understanding of how our Solar System was formed.” And should we ever visit a Planet Nine, it would change our conception of what planets look like and further help us understand the structure of our Solar System, he said. First things first, however: We need to find Planet Nine. If it even exists. When the Hell Will We Find Planet Nine?